Martha Besuden, our teacher of Pre-School and Moms and Tots, is a certified professional with over 16 years of experience in preschool and elementary education. She has a warm and loving personality and welcomes children to become comfortable with the school environment and activities at their own pace. We are very fortunate to have her! Belinda Enge is our teacher for the Kindergarten Enrichment program. 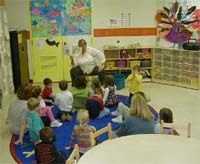 Belinda previously taught at a Pre-School in Novi, MI. She holds a Bachelor's degree in Education and Psychology. She has been an active member on the Lakeland Co-Op Board for 4 years. Belinda has a wonderful ability to relate easily to children making them feel comfortable and loved. Belinda has 3 children. 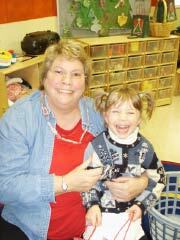 Donna Laws is the assistant teacher for the Kindergarten Enrichment program. She has worked for many years in the State Head Start program. Donna is a patient and gentle teacher who always has time to listen to the children. She has 2 children. We retain, minimally, a 1:5 classroom ratio of adults to children! ALL kids, from the shy and cautious to the outgoing and assertive, receive the special and personal attention they deserve. We are licensed by the Michigan department of Consumer and Industry Services/Family Independence Agency and are a member of The Greater Detroit Cooperative Nursery Council.